Most wanted A#1: The RADIO AUDIO to the 1969 NEBRASKA vs KANSAS GAME! I just got in a gorgeous color film and would like to add the radio audio to the silent film! ANY NEBRASKA BASKETBALL RADIO AUDIO! $$$ Cash paid $$$ for old VHS/Beta/cassette/reel-to-real home recordings of Nebraska games I don't have. I'm looking for original broadcasts as seen or heard on day of the event. Original recordings preferred. Depending on quality, dubs would be considered. Depending on the year, Nebraska basketball games and other sporting events also considered. If you have any old recordings, there's a chance we could play it on the air! Any Charles Starkweather news footage. I'm a "time period fan". I'd love anything from the early 70's and older....especially college football. The network telecast of the Dallas vs Green Bay. 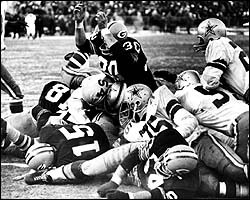 The "Ice Bowl". NBC's telecast of the 1968 AFC Championship: New York Jets vs Oakland or a game film ( I have the radio audio). The CBS broadcasts of the 1970 & 1971 Cotton Bowls between Texas & Notre Dame. NBC's broadcast of the 1971 Kansas City-Miami overtime playoff game. The NBC network broadcast of the 1972 AFC Divisional Play-off, Pittsburgh vs Oakland. The immaculate reception! The NBC network broadcast of the 1974 AFC Divisional Play-off, Miami vs Oakland. The "sea of hands game"! A top-flite copy of the network broadcast of the 1977 AFC Divisional Play-off, Baltimore vs Oakland. The "ghost to the post"! Check my audio list. I need many Pre-1970 games! Especially any radio to go with silent films, such as: 1960 Nebraska-Texas, 1965 Nebraska-Oklahoma and 1969 Nebraska-Kansas. NBC's broadcast of the 1953 Nebraska-Oregon game. NBC's broadcast of the 1955 Orange Bowl, Nebraska-Duke. NBC's broadcast of the 1957 Nebraska-Iowa State game. NBC's broadcast of the 1958 Nebraska-Colorado game. NBC's broadcast of the 1958 Nebraska-Kansas game. CBS's broadcast of the 1962 Nebraska-Missouri game. ABC's broadcast of the 1962 Gotham Bowl Nebraska-Miami. 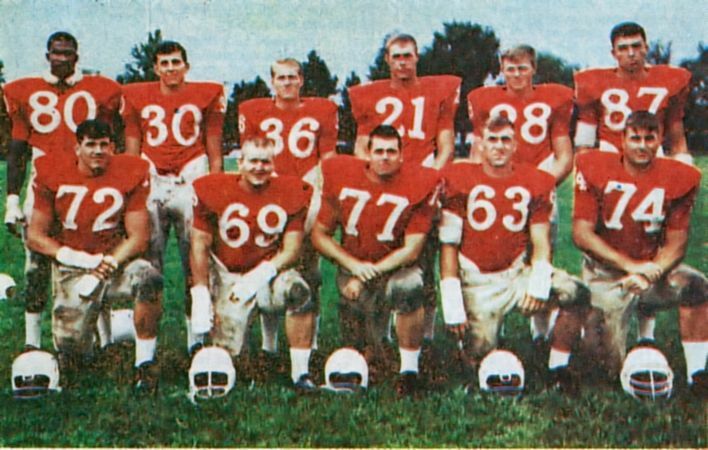 The radio audio to the 1963 Nebraska-Air Force game. I have the silent film. ABC's broadcast of the 1964 Orange Bowl Nebraska-Auburn. 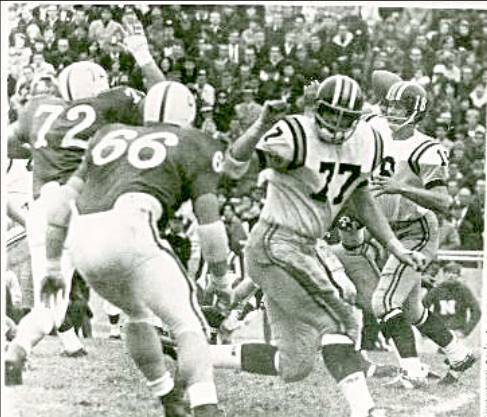 NBC's broadcast of the 1964 Nebraska-Minnesota game. CBS's broadcast of the 1965 Cotton Bowl Nebraska-Arkansas. The radio audio to the 1965 Nebraka-Air Force game. I have the silent film. NBC's broadcast of the 1965 Nebraska-Oklahoma game. Or, the radio audio...I have the game film. NBC's broadcast of the 1966 Orange Bowl Nebraska-Alabama. ABC's broadcast of the 1966 Nebraska-Missouri game. The radio audio to the 1966 Nebraska-Colorado game. I have the silent film. ABC's broadcast of the 1966 Nebraska-Oklahoma game. 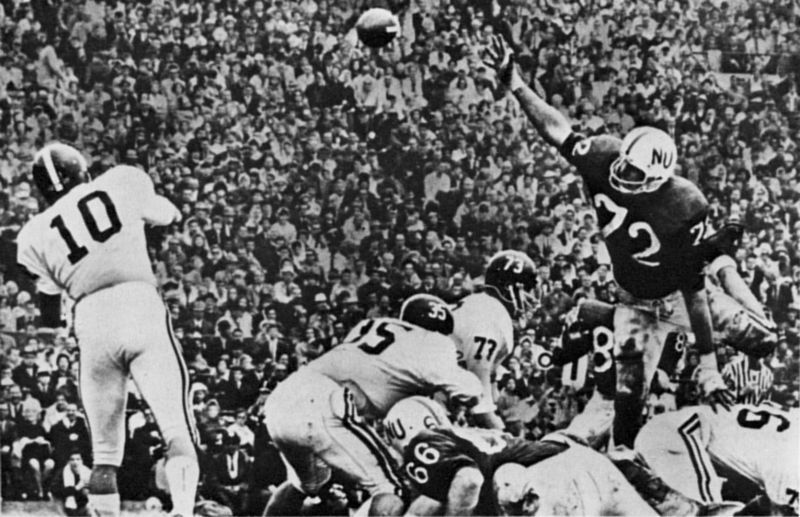 ABC's broadcast of the 1967 Sugar Bowl Nebraska-Alabama. ABC's broadcast of the 1967 Nebraska-Oklahoma game. ABC's broadcast of the 1969 Nebraska-Texas A&M game. ABC's broadcast of the 1970 Nebraska-Colorado game. 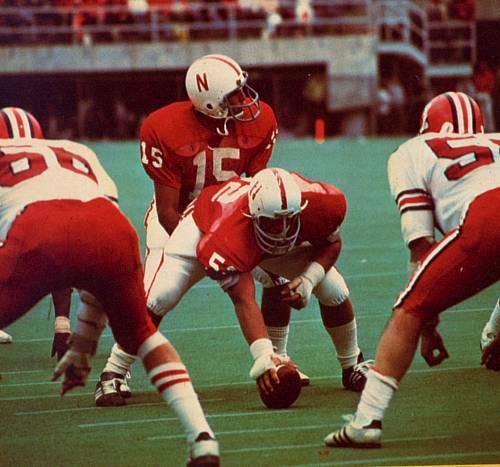 The radio audio of the 1971 Nebraska-Oregon game. ABC's broadcast of the 1971 Nebraska-Colorado game. The local island TV broadcast of the 1971 Nebraska-Hawaii game. ABC's broadcast of the 1972 Nebraska-Army game. ABC's broadcast of the 1972 Nebraska-Colorado game. NBC's second half of the 1973 Orange Bowl, Nebraska vs Notre Dame. ABC's broadcast of the 1973 Nebraska-UCLA game. ABC's broadcast of the 1973 Nebraska-Oklahoma game. CBS's broadcast of the 1974 Cotton Bowl, Nebraska-Texas. Or, a good, complete film....I have the radio audio. ABC's broadcast of the 1974 Nebraska-Wisconsin game. ABC's broadcast of the 1974 Nebraska-Colorado game. Or, a game film. I have the radio audio. ABC's broadcast of the 1975 Nebraska-Missouri game. ABC's broadcast of the 1976 Nebraska-Missouri game. Or a game film. I have the radio audio. The first half of ABC's broadcast of the 1976 Nebraska-Oklahoma game. ABC's broadcast of the 1977 Nebraska-Oklahoma State game. ABC's broadcast of the 1977 Liberty Bowl Nebraska-North Carolina. Or, a good, complete film....I have the radio audio. ESPN's broadcast of the 1979 Nebraska-Iowa game. An upgraded copy of ESPN's broadcast of the 1980 Nebraska-Iowa game.